The past five days added more color to the emerging picture of U.S. economic growth that is slow and unsteady — but still in gear. Investors decided that was good enough, and bid up risky assets. The Standard & Poor's 500 Index rose 1.4%, emerging markets rose 1.8%, gold rose 2.2% and bonds fell. Underlying breadth modestly weakened, as the market is primarily being propelled now by a withdrawal of sellers — not an increase in buyers. News late in the week typified the entire span, as it mostly favored bulls. Indeed, the U.S. economy faces an uphill climb but some companies are emerging as market leaders. On the positive side of the ledger besides jobs was a lot of buoyant action among retailers' shares and company action: The Kroger Co. (NYSE: KR) raised its dividend by 11%, GameStop Corp. (NYSE: GME) said it would spend $500 million to buy back shares, and low-end teen apparel vendor American Eagle Outfitters (NYSE: AEO) tried higher prices on for size. Another positive for bulls: The recent decline in the U.S. dollar, which we have followed closely for weeks, has hit a critical stage, as you can see above. The dollar has led equities for the past year, and the equity rally of the past three weeks has followed the buck's decline. But now the dollar is right at its uptrend line, as you can see in the chart above, so it is make or break time. A rebound here would squelch the rally in stocks and commodities, while a breakdown would sound like a big, "Party on, Garth!" to the bulls. On the negative side of the ledger came news from FedEx Corp. (NYSE: FDX) that although revenue in its most recent quarter was up 18% year over year on "improved global economic conditions," executives saw "somewhat slower growth going forward," and axed 1,700 full time workers. FDX also issued guidance for its fiscal second quarter that missed estimates. This sort of good news/bad news earnings report — summed up as, "everything's great, but we're not hiring" — will be a harbinger of things to come, as the third quarter might turn out to be a period of peak earnings for awhile. It's too soon to say that with certainty, but that's the vibe we are getting from some early-reporting industrial companies. A great example of the good news/bad news environment came on the corporate earnings front for software maker Oracle Corp. (Nasdaq: ORCL) and Blackberry smart-phone maker Research in Motion Ltd. (Nasdaq: RIMM). Both beat estimates and lifted forward outlooks, but only ORCL received an embrace from investors because it has managed to buy rival complementary companies and stymie its rivals with brutal efficiency, while RIMM appears stuck with a customer base that is eroding by the minute and seemingly no ambition to buy rivals or ability to block them. 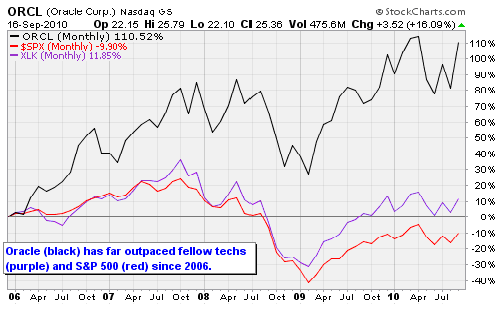 Note in the chart above how well Oracle has done since 2006. It's up 110%, which is 100 fat percentage points better than the Technology Select SPDR ETF (NYSE: XLK), and miles ahead of the S&P 500 Index and layabouts like RIMM. What's next for the database software king? When in an uptrend in mid-September, Oracle tends to go on to have a successful fourth quarter, rising an average of 8.7% over the next nine weeks, including +17% in 2006, +22% in 1998 and +15% in 1992, though last year it fell -1.4%. Investors adore cost-cutting ace Mark Hurd, the new co-president who moved over to the company after exiting Hewlett Packard in a cloud of scandal — and will give the stock a premium valuation for that reason alone. 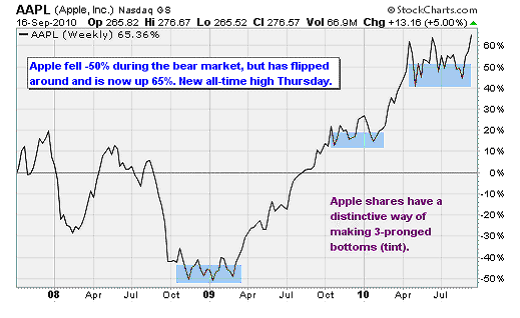 And speaking of outperformance, a new high was hit on Thursday by Apple Inc. (Nasdaq: AAPL). Not too long ago we were complaining about a lack of leaders. Well, you can't do much better than seeing a rally led by Apple and Oracle. The banks and semiconductors need to get it in gear now. If they do, the second half of the year could be quite exciting. The main point for year-end is not to make pessimism an investment philosophy. It's unproductive and unnecessary. There are plenty of individual industrial niches, asset classes and countries that are in full-out growth mode — and are capable of being tapped easily and inexpensively to aid in reaching your investment goals. Gawk at the troubles on the side of the road, but don't linger. One of the most interesting areas right now is discount retail, led by Family Dollar Stores Inc. (NYSE: FDO), shown above. 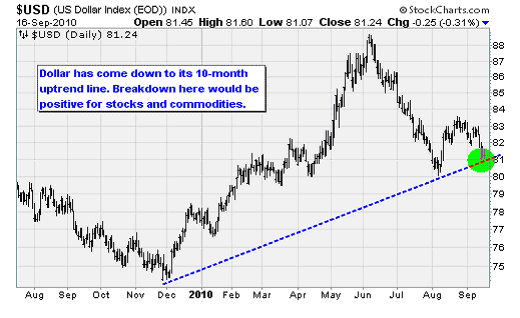 It's an odd duck in that it tends to perform very well at times when the U.S. economy is weak, and then sells off when the economy strengthens. Note that it was up in 2000-2002, then sold off in 2003. Then it was up in 2008, and flat-lined in 2009. Now it's up again, and still under accumulation. Other stocks on my letter's list hitting new all-time highs recently include insurer Allied World Assurance Holdings Ltd. (NYSE: AWH), mall-operator Realty Income Corp. (NYSE: O), and food additive maker Balchem Corp. (Nasdaq: BCPC). There really is a bull market going on in both bigcaps like Apple and Oracle, as well in niches like Family Dollar, once you know where to look. Some Chinese data emerged over the past week that you need to know about: Industrial production in the Middle Kingdom rose 13.9% year-over-year in August, more than the 13.0% economists had expected, while 18.4% year-over-year growth in August retail sales, a 24.8% year-over-year rise in August urban investment, and new yuan loans rising to 545.2 billion yuan for August all exceeded forecasts as well. That ignited optimism about the health of the economy that is so important to our investments in countries like India, Thailand and Chile, which are suppliers and trading partners. China's Producer Price Index gained 4.3%, slightly lower than forecasts, which allayed fears that the economy was overheating to a degree that would require corrective action. Chinese Premier Wen Jiabao said that the nation's economy was in "good shape with fast growth, gradual structural improvement, rising employment and basic price stability." He added that the country will continue to limit property speculation and preserve stable housing prices. Good luck with that, Wen. Meanwhile, down in the southern part of Asia, the executive board of the India's biggest pension plan meets Wednesday to decide whether to invest a part of its massive fund in stocks. Its $106 billion — the savings of 50 million public and private sector workers — is now mostly entirely invested in government and agency bonds. The Wall Street Journal reports that not long ago, India's stock markets wouldn't have been able to accommodate money of that size. But from 2002 to 2009 the market capitalization of India's two major exchanges has risen more than tenfold, to $2.5 trillion. The proposal is opposed by India's large labor unions that are wary of putting workers' savings at risk. But The Journal says that is not stopping the government in New Delhi from trying. Long-term equity market returns in India will be at least 15% per year, analysts at Mercer estimate, nearly double the 8.5% currently generated by the fund in fixed income. If the fund was to invest up to the 15% limit currently imposed on non-governmental funds, that would be roughly $16 billion, or close to what foreign institutions invested in India's stocks last year, the WSJ said. The long-term orientation could have a positive effect, as short-term speculators currently play the largest role in Indian exchanges. The Journal reported that the government has a long-term plan to reduce its ownership of some of India's biggest companies. Having the pension fund start by buying those would be one way to assure workers their money is still under the government's umbrella. The main point here is that when a major new player comes into a market, its complexion changes. 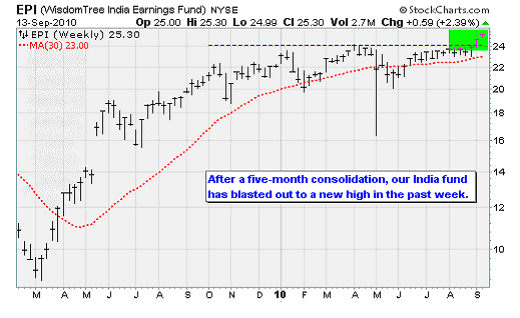 If the vote is positive, it should give another boost to Wisdom Tree India Earnings Fund (NYSE: EPI), which jumped out to a new two-year high on Monday. Now about that new global banking agreement announced last week, nicknamed Basel III. The actual news was a new set of rules issued by a board that oversees the Basel Committee on Banking Supervision that are intended to enforce "substantial strengthening of existing capital requirements." As mentioned last night, the key point is an increase in the minimum common equity requirement at banks to 4.5% from 2%, plus a "buffer" of 2.5%, bringing the total common equity requirement to 7%. Do you think investors applauded this because it was so tough it would ensure no disaster occurred again? If you said yes, you are just not cynical enough. The truth is that bank investors were breathing a sigh of relief that capital requirements were not more stringent and that banks will have eight years to comply. Well, what did you expect? Falling below the buffer's upper range will mean a bank cannot pay out dividends or buyback shares until its Tier 1 capital ratio is back over 9%. Let's consider the effects. 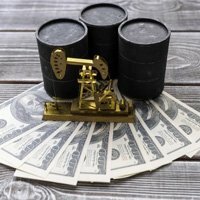 As TIS Group analysts noted on Monday afternoon, in the long run putting more capital in place as a counter-cyclical buffer ought to be a big positive. It's like a family that has put earthquake supplies away in a pantry; you may never need them, but it's comforting to know they are there. In the short run, TIS analysts estimate that as much as 140 billion euros may need to be raised by European banks alone to meet the requirements. They may have four years to raise that money, but that's still a ton of stock to sell. A continuing supply like that may blunt any bank rally in its tracks. Indeed, prices may have to come down to entice buyers. In most developed world indexes, financials have the highest weight of all sectors. So if their progress is stymied, indexes might have trouble making progress as well. That's fine with me, because we can just avoid them and that would be an easy way to beat the indexes. Here are milestone measurements on the economy, with a big hand from the analysts at Econoday. — Retail sales show consumers still contributing to the recovery. Consumers make up 70% of gross domestic product (GDP), though two thirds of that is services. And a report on August retail showed they are pretty much holding up their end of the bargain. Overall retail sales in August rose 0.4%, extending a 0.3% gain in July. Outside of autos, sales were +0.6%. This was better than expected but still very modest for a business cycle recovery. — Would you believe a lot of the increase came in convenience stores? Gas station sales starred with a 1.9% increase, while clothing was up 1.2%. Also rising: health & personal care, sporting goods & hobby stores, general merchandise, food services and bars. Weakness: A 1.1% decline in appliances and a 0.7% drop in motor vehicle & parts. — Bottom line: No double dip, as consumer buying supports an OK figure for third quarter GDP. — Consumer sentiment drops. This was odd, as usually when the stock market is up and unemployment claims are down, sentiment is up. But this time, no dice. The mood of the consumer is not improving, and even slipped in September. The Reuters/University of Michigan consumer sentiment index for the mid-September reading fell 2.1 points to 66.6 to erase the gain made in August. — Consumers downgraded their expectation for the future, to an index reading of 59.1 from 62.9 in August. This is the lowest reading of the recovery, but still above the recession low of 49.2. The expectations index is important because it's considered a leading indication for the economy. There's still a lot of pent-up buying that is being done, but this does not bode well for the holidays. — Industrial production lost steam. This is not good because factories have been a big source of strength in the recovery. IP in August rose 0.2%, following a 0.6% rise in July. The worst component of the survey was a drop in output of motor vehicles and parts, down 5% in August after a -9.5% jump in July. So the bottom line here is that momentum is not as strong as it was a few months ago in durable goods, but it's still growing. — Regional manufacturing in the Philadelphia in New York regions was tepid, with a general business activity up but unfilled orders and the workweek down. A slow plod, not a contraction. — Consumer price index (CPI) figures were reported up 0.25% in August, which was barely short of expectations of an 0.3% rise. Excluding food and energy, which are notoriously volatile, core CPI nudged up only 0.046%, which was less than half the expected 0.1%. That doesn't sound like much of a difference, but looking under the hood at falling costs of home, lodging away from home, household furnishings, recreation, educational supplies and the like, it's clear that companies are having a very hard time getting prices to stick. They are using a lot of promotions to generate business. More broadly, on a year over year basis, CPI is down to 1.1% from 1.2%, while core CPI is unchanged at 0.9%, which is the lowest level since 1961. Analysts at Ned Davis Research point out that falling inflation rates and a sluggish economy are feeding deflationary fears. 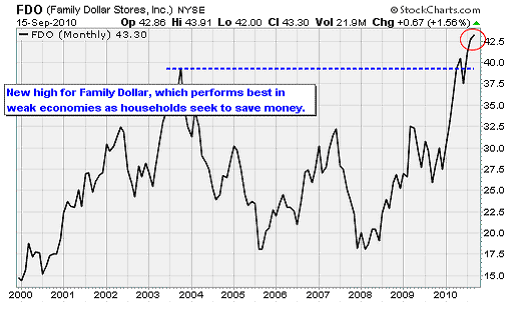 Deflation sounds bad, and it is, but the Fed wants to fight it, which means more cheap money, which is good! See how that works. Be happy. The theme for the early part of the coming week will be trends in housing, as well as Fed-watching — and at the end of the week will come a durable goods report. Monday: Nothing major planned. Earnings: Lennar Corp. (NYSE: LEN). Tuesday: Housing starts for August will be released. They bounced back a little in July after a terrible June. Figure starts are still under pressure due to the large inventory overhang, as new homes on the market rose to 9.1 months in July. My estimate for starts in August: Run rate of 535,000 units/year. The Federal Reserve meets, and we expect rates to stay in the 0-0.25% range. Investors will scrutinize the press release for signs of additional quantitative easing. My expectation: Not yet, probably later in the year. Earnings: Adobe Inc. (Nasdaq: ADBE), AutoZone Inc. (NYSE: AZO), Cintas Corp. (NYSE: CTAS), ConAgra Foods Inc. (NYSE: CAG). Thursday: Initial jobless claims kick it off. They slipped 3,000 to 450,000 in the week of September 11, and the four-week average posted its sharpest decrease of the year, down 13,500 to a 464,750 level. My expectation is that the number has worsened a little: 455,000. Existing home sales will also be reported. They plunged in July, but there might be some improvement as contract signings were reported up. Figure it'll come in at a 4 million/unit annual rate. Consensus range is 3.8 million to 4.5 million. Conference Board will announce its index of leading indicators. This has been very uneven to poor, and now suggests that the economy is headed toward slow growth. Earnings: Bed Bath & Beyond Inc. (NYSE: BBBY), Darden Restaurants Inc. (NYSE: DRI), General Mills (NYSE: GIS), Jefferies Group Inc. (NYSE: JEF), Red Hat Inc. (NYSE: RHT). Thursday: Nothing major planned. Earnings: The Finish Line Inc. (Nasdaq: FINL), Neogen Corp. (Nasdaq: NEOG). Friday: Durable goods report before the bell. This could rattle the markets as it's likely to be down quite a bit after the big non-defense aircraft gains last month. Since the Philly and NY Fed new orders are down, figure this could be a little bit rotten, at -1.1%. New home sales will be reported too. Supply is rising and homebuilders say looky-loos were down. Earnings: KB Home (NYSE: KBH).